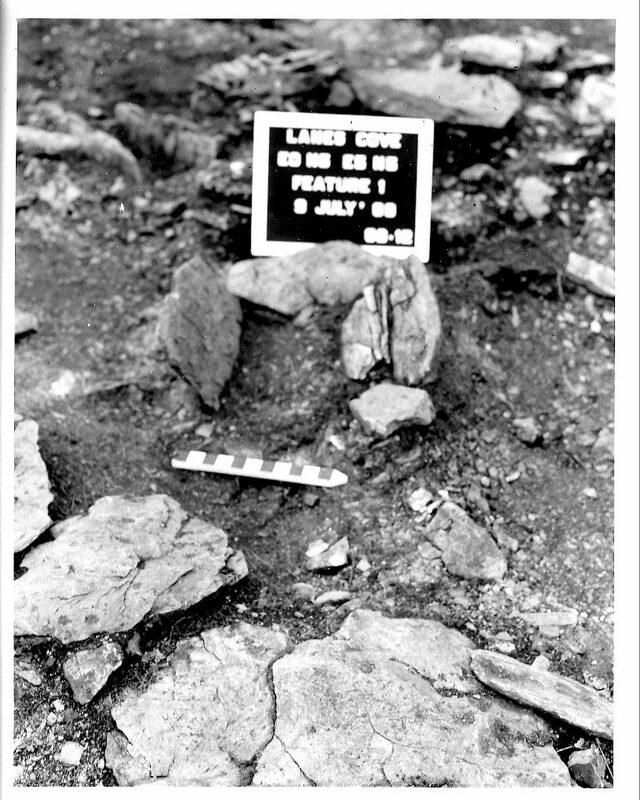 In July of 1969, Dr. James Tuck and his crew, Simon Dawson and Ches Skinner, excavated a Dorset Palaeoeskimo site at Lane’s Cove in Englee on the Northern Peninsula of Newfoundland. The excavated portion of the site was around 30m2 which is not a large excavation area. Despite its size it contained a considerable amount of cultural material. There is not a lot of recorded information about this site. It is briefly mentioned in a few reports and there is a little more detail in a Masters and Doctoral thesis. We also have two notebooks, one each by Dawson and Skinner, which contain about 6 pages of hand-written notes from the 1969 excavation. When I recently came across a folder with old photos and hand-drawn plan maps of the excavation, I thought it would be a good opportunity to update what we know of the site. Englee is on the east side of the Northern Peninsula in Canada Bay. Today there are at least 13 recorded sites in the area, including several other Palaeoeskimo sites and one of the few known Dorset burials. There are also several European sites and one Maritime Archaic site. 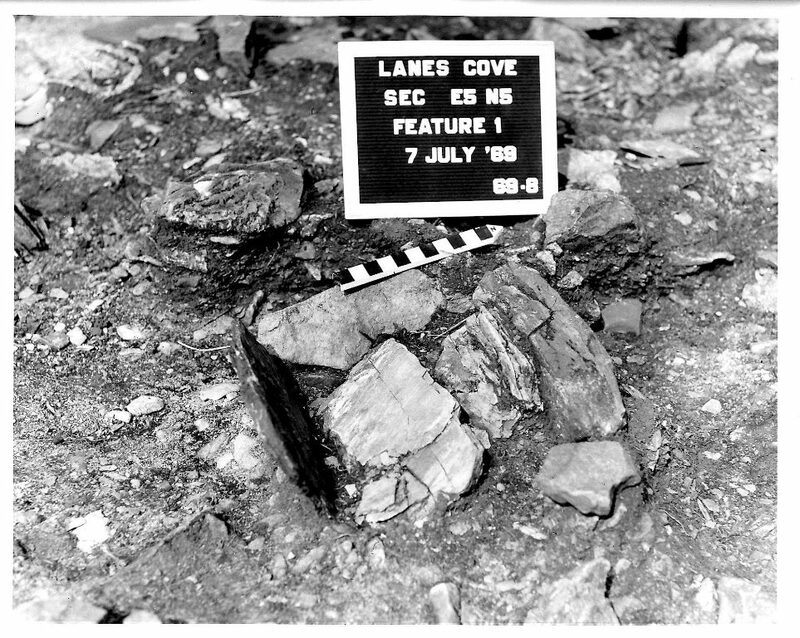 Lane’s Cove seems to have been the first site recorded in the area. Based on the photos and notes there were a least four features identified during excavation. Feature 1 seems to have been a small box-hearth. 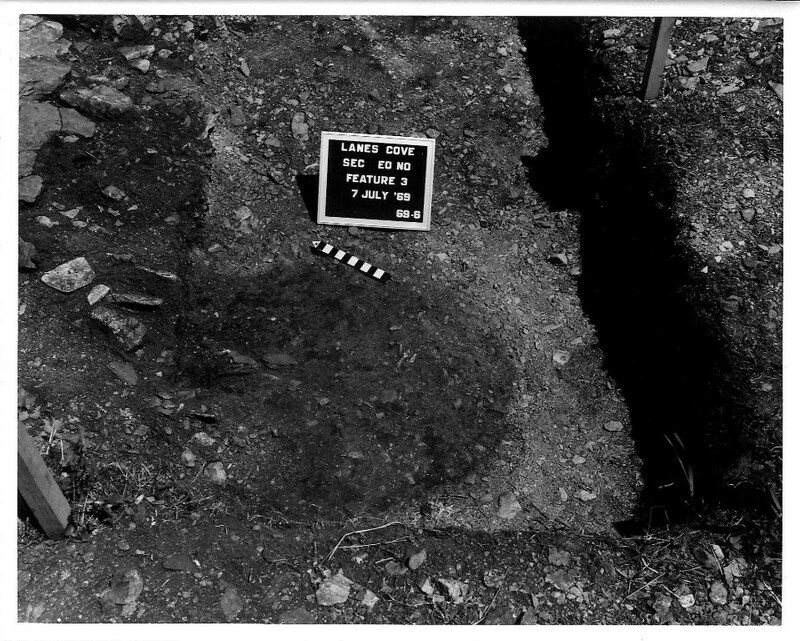 The scale in the photo is one foot divided into inches, so the hearth appears to have been about 18 to 24 inches square. Either this feature or another on the site yielded enough charcoal to run a radiocarbon date, the result was 1586±95 years ago (uncalibrated I-4379) which is typical of Dorset on the island. 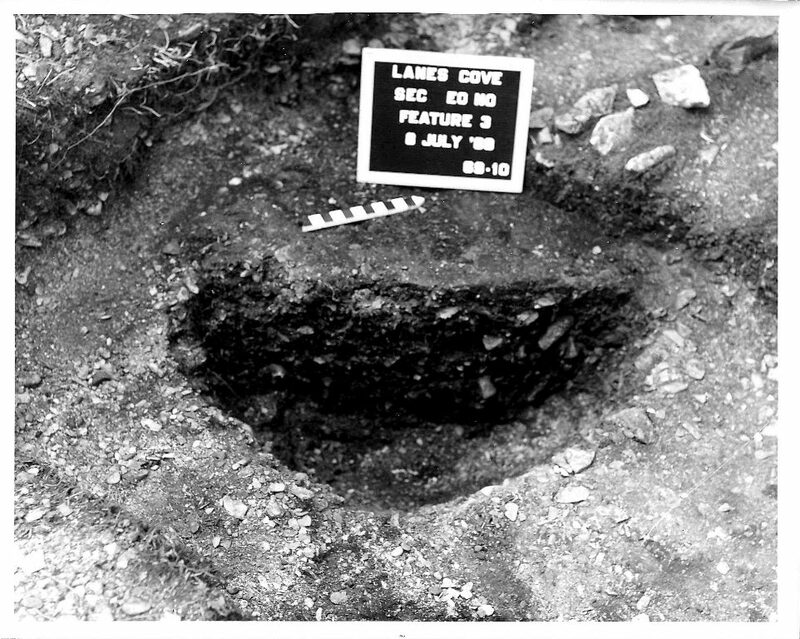 Feature 1, box-hearth, Lane’s Cove, 1969 (Tuck?). The hearth is not completely excavated in this photo. 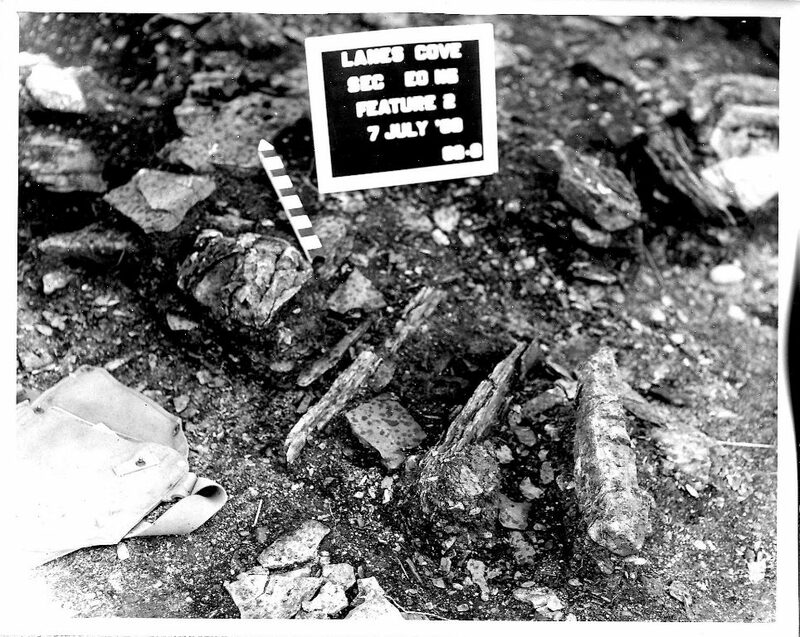 Box-hearths are more typical of Groswater Palaeoeskimo but in 1969 that culture was not yet recognized archaeologically so there is no record of them being at the site. Having looked at the artifacts from the site I can say there is a previously unrecognized Groswater Palaeoeskimo component to this site. 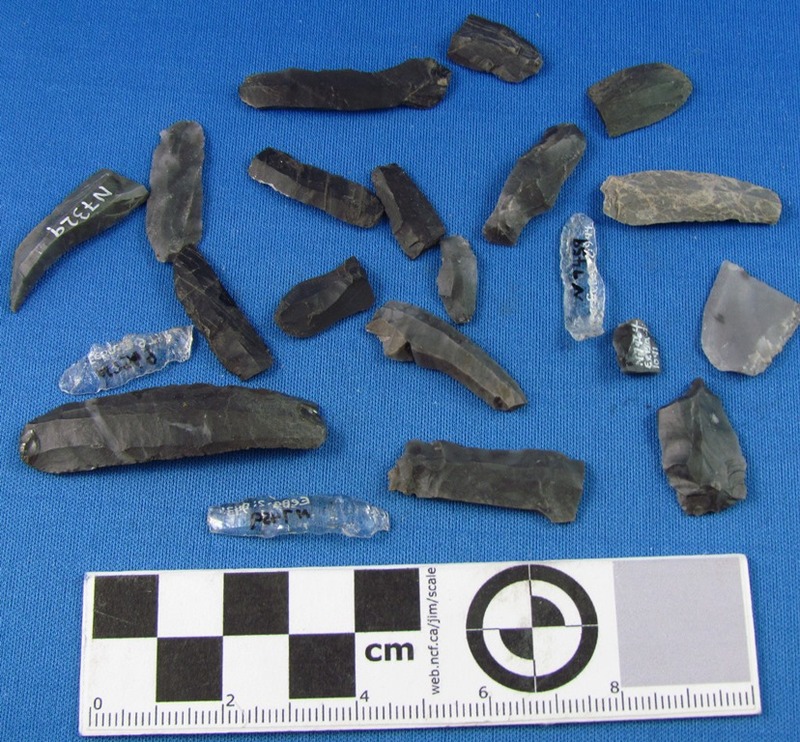 The top three artifacts, left to right are an ‘eared’ scraper, a semi-lunate knife and a box-based end blade, all typical Groswater Palaeoeskimo artifacts. Bottom row, second from the right is another ‘eared’ scraper. Feature 2, based on the photos, may have been a second box-hearth. In the very least it appears to consist of two upright stone slabs which certainly is suggestive of a box-hearth. Feature 3 was a pit that initially showed up as a stain/deposit on the surface of the soil. Based on the photos it is not clear what the feature was composed of but based on the field notes I would suggest that it was some kind of organic deposit perhaps made up of bones. Both excavation notebooks make note of the large quantity of bones recovered from the site including seal, bird and fish. 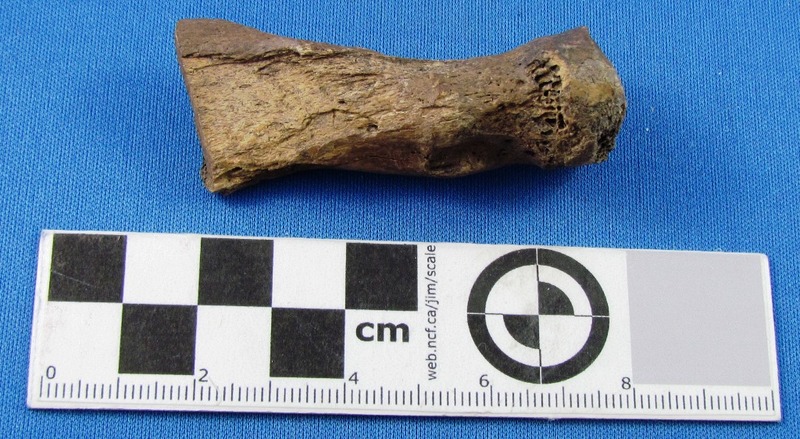 A cut bone recovered from Lane’s Cove. Salmon bone recovered from Lane’s Cove. Faunal recovered from Lane’s Cove. Feature 4, according to the photos, was next to Feature 2. It was made up of a flat slab of rock that was badly shattered. The rock appears to be something like schist, shale or slate, the presence of all these types of rock are noted on the hand-drawn plan maps. The notebooks also record that there were artifacts made of bone. 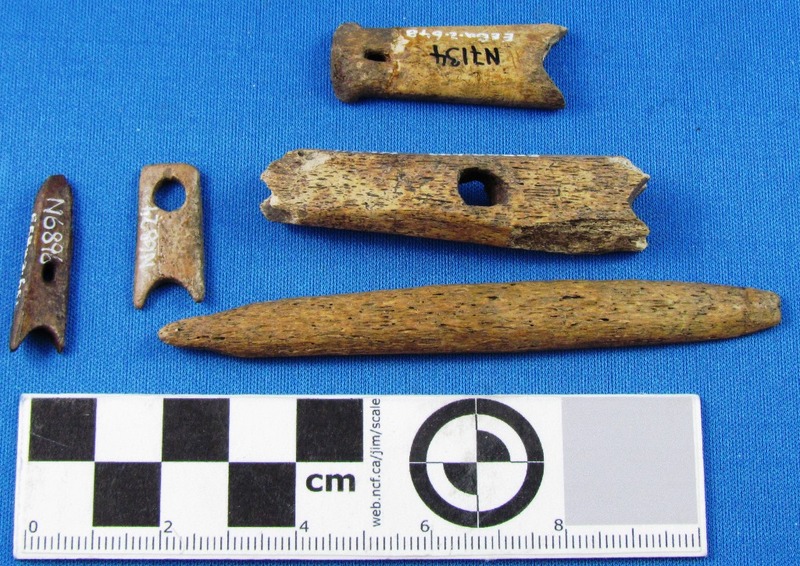 For example, they recovered a bone harpoon that was described as having ‘…an unfamiliar type point slot.’ There was also an antler or ivory artifact that had engravings on it. 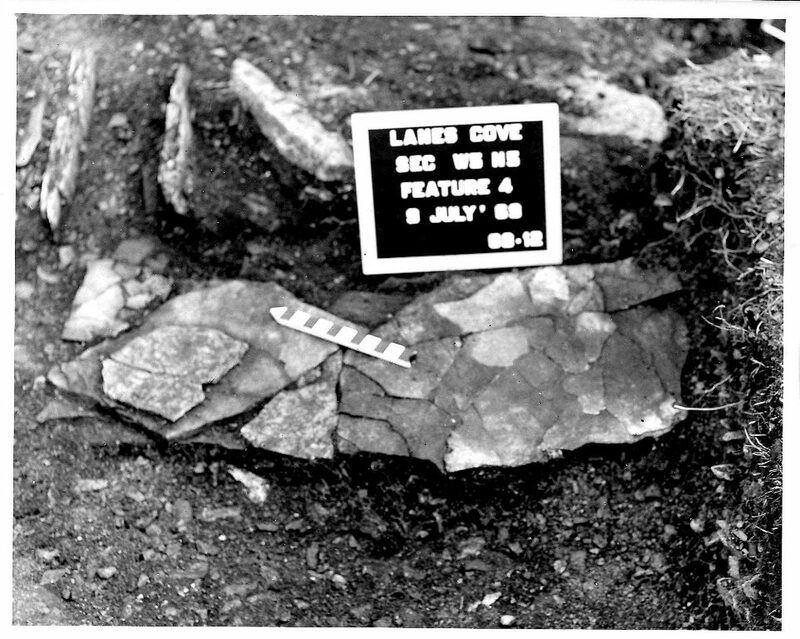 Bone artifacts from Lane’s Cove. 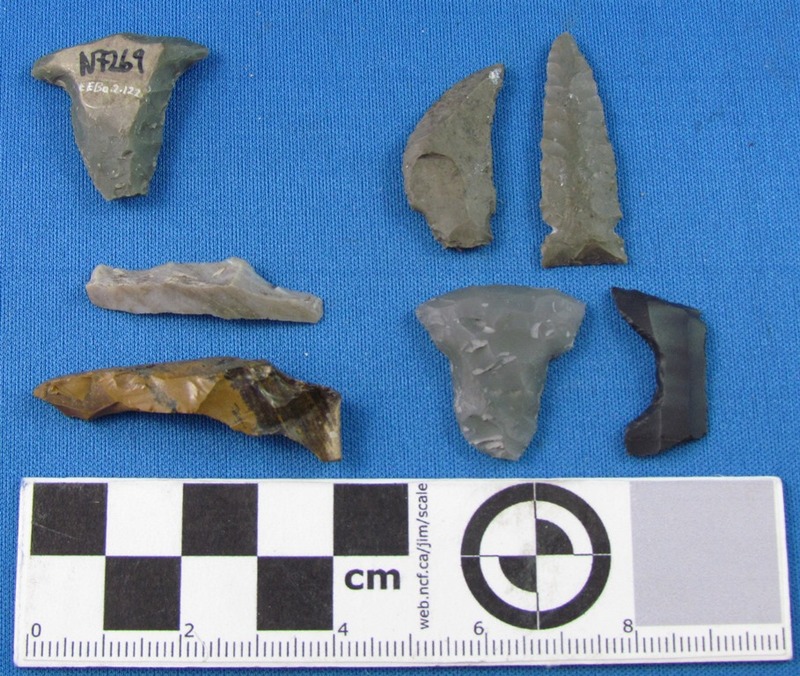 Middle right artifact is a harpoon and below that is likely a bone lance. I am not sure what the other three objects are. 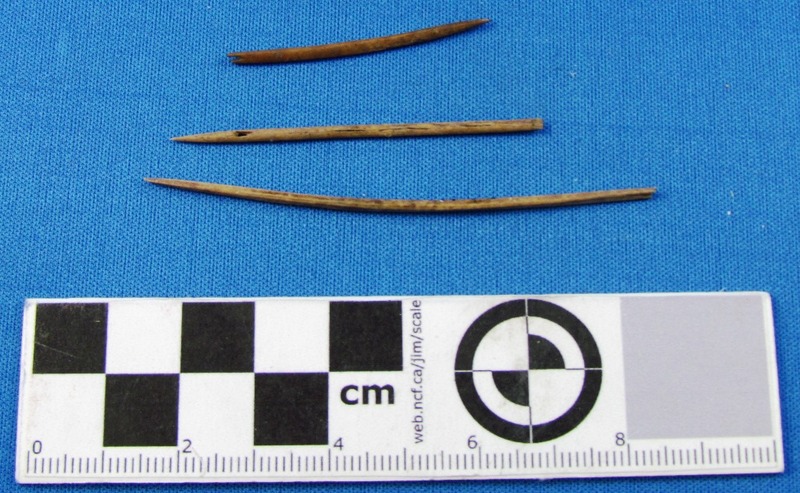 Bone needles recovered from Lane’s Cove. 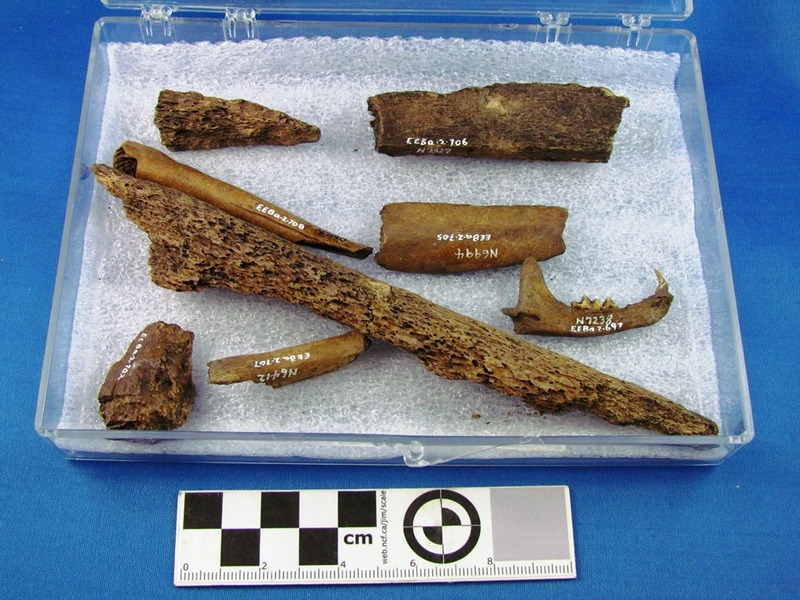 The notebooks also record that ‘…almost equal in quantity to the bones were the chips (stone flakes) which ranged from 3″x2″ nodules to tiny flakes.’ As dense as the site was in terms of flakes and faunal, there were almost as many artifacts. 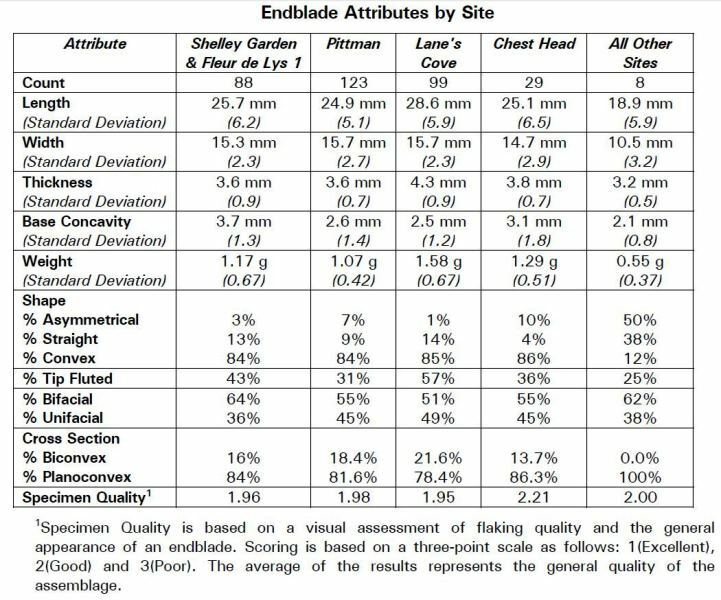 The data that I have suggests the site had a total of 1489 artifacts. 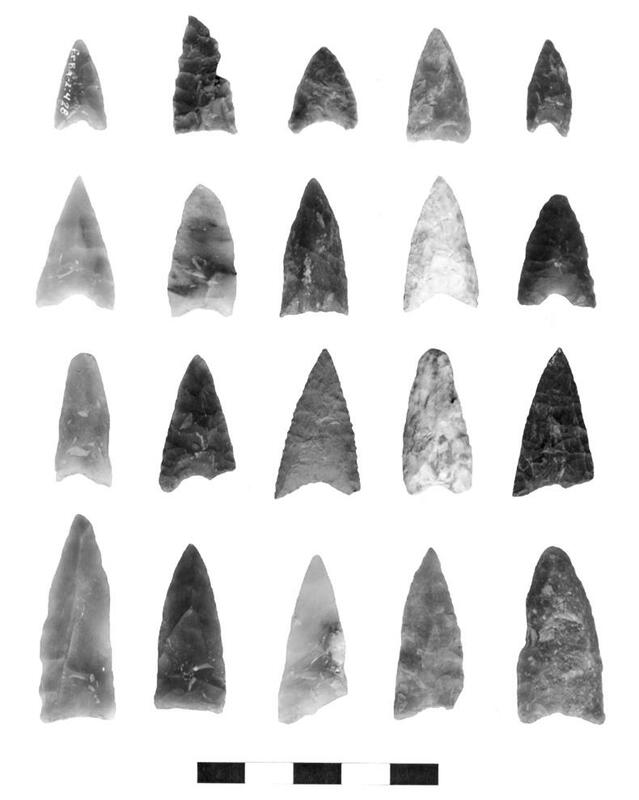 At ~30m2 in size, that’s an artifact density of nearly 50 artifacts per excavation unit. 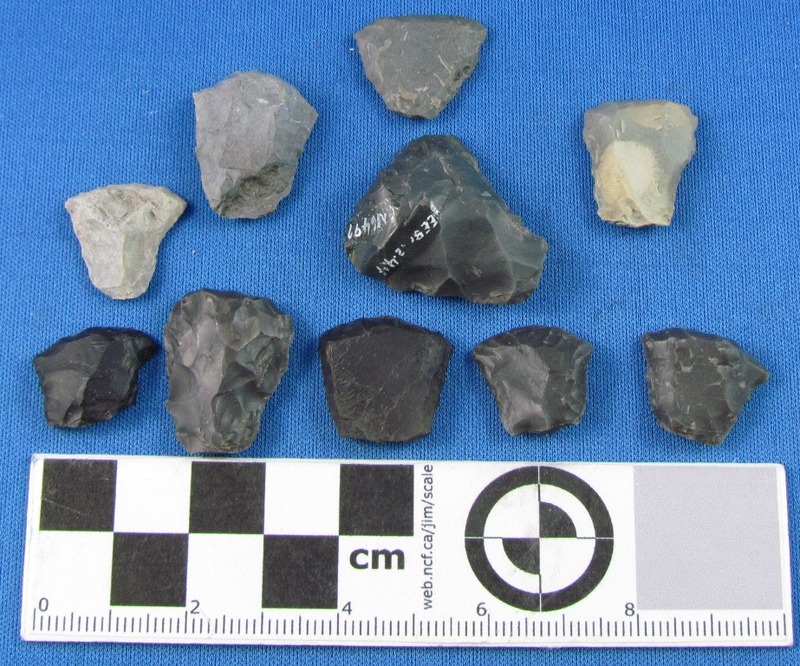 Based on the description from the notebooks the lithic artifacts include endblades, end and side scrapers, utilized flakes, cores, soapstone (probably from Fleur de Lys) and side-notched knives. 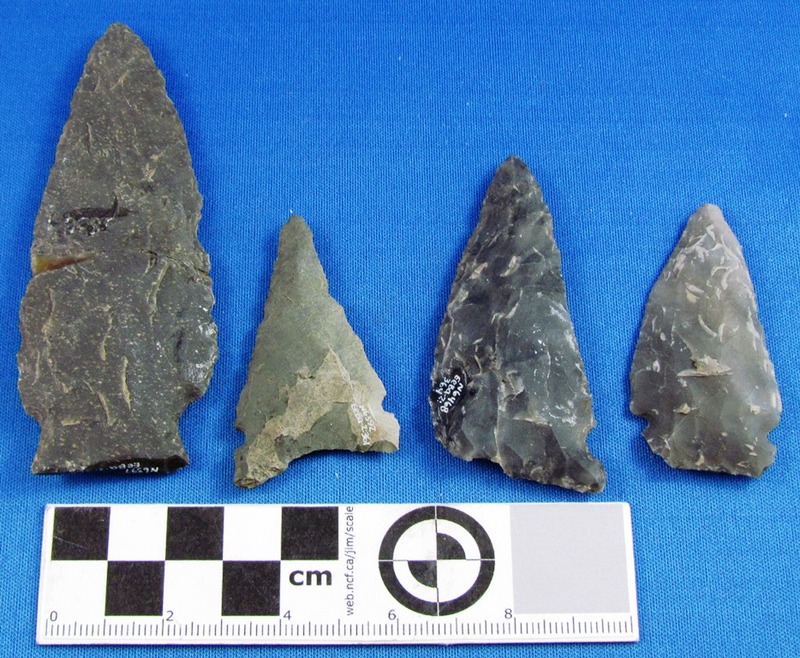 Stone knives recovered from Lane’s Cove. 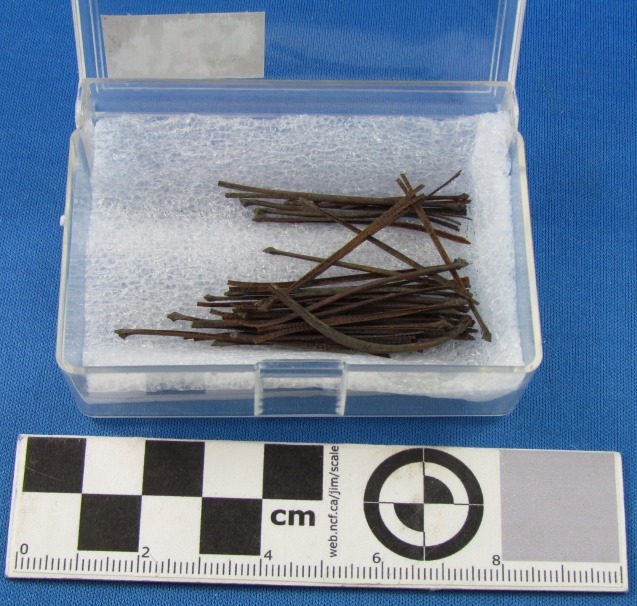 Microblades recovered from Lane’s Cove. Various end scrapers recovered from Lane’s Cove. 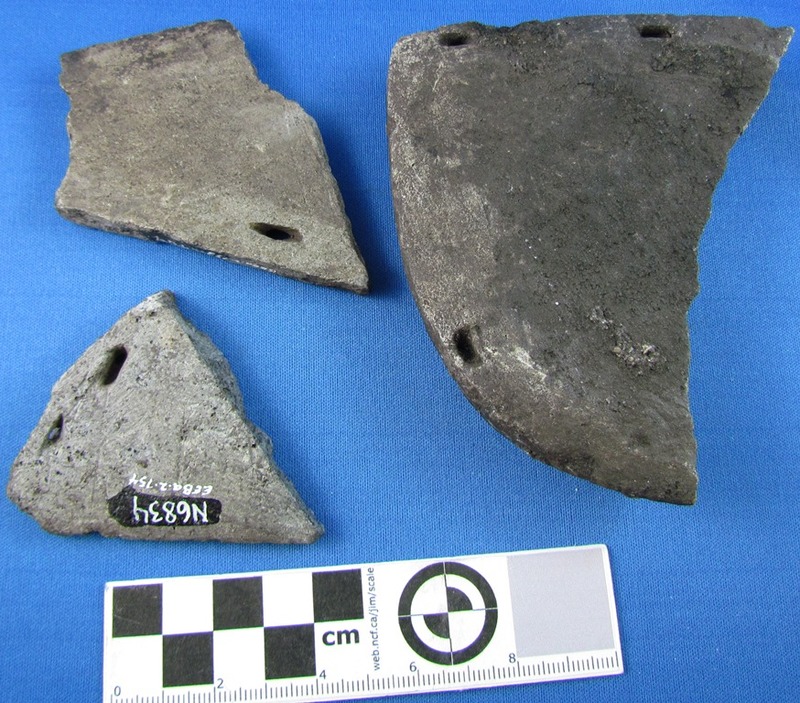 Soapstone pot fragments recovered from Lane’s Cove. 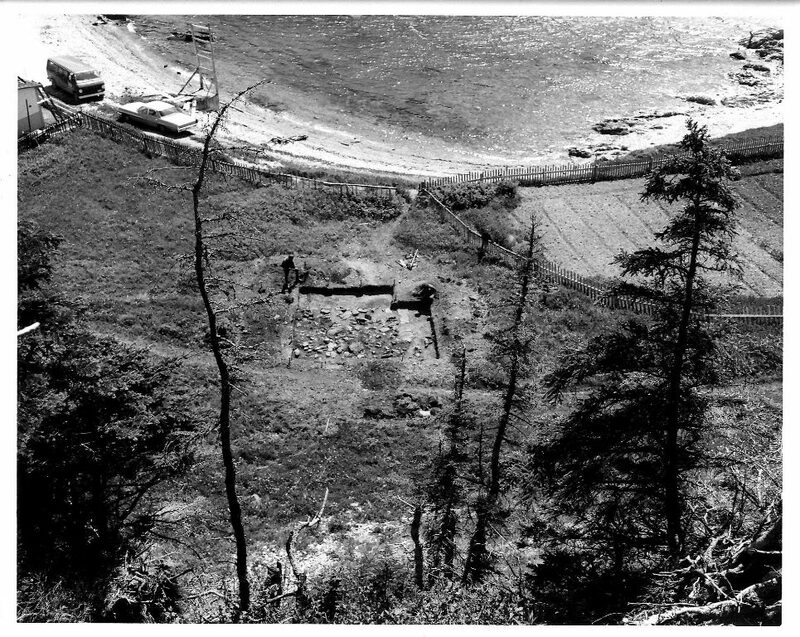 Erwin summarizes Lane’s Cove nicely by writing: ‘The artifact assemblage is representative of a cold weather residential base camp that can be interpreted as an important component of a sizeable Dorset occupation in this region…’ (2001:192) Without a final report, there is not a lot more we can say about Lane’s Cove. 1969 Hand-written notes on Englee (EeBa-03), Lane’s Cove (EeBa-02) and New Ferolle (EgBg-01). 2001 A Prehistoric Soapstone Quarry in Fleur de Lys, Newfoundland. Ph.D, University of Calgary.